TechNote Time's EDISON Ohm's law wrist watch is a beauty! Includes the DC (direct current - more basic ohms law - as shown in image on left) OR the AC (alternating current - more advanced ohms law - as shown below, the bottom image) on the dial. 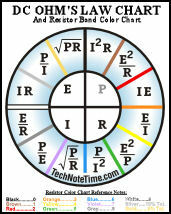 The dial face also includes TechNote Time's exclusive resistor band color chart. Select DC or AC Ohms Formulas? 24" x 30" OR SUPER SIZE 36" x 45" Posters! 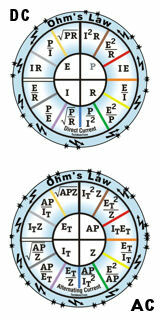 Ohm's law wall charts for classroom, workroom, training center, etc. Beautiful full-color glossy charts highly visible from any place they are located! These Ohms law posters are huge and what an impression they will make! Order the AC (Z formulas - follow image for the AC chart) and/or the DC (R formulas - as shown). 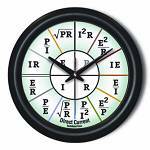 Color your Ohm's law world with an exhuberant expression of color AND design - read more about our resistor band color chart on the wheel by following the image! Discount given as noted if you order both sets of power wheel charts/posters.